A huge huge congrats to the Smartaupairs au pair of the year 2017-18 winner EVELIEN from Holland. Each year, Smartaupairs chooses one au pair who has really gone the extra 1000 miles to help their host family to win the Smartaupairs of the year award. Upon reading both the nomination letter and Evelien's own account, you will no doubt understand why Evelien has been chosen as the winner. 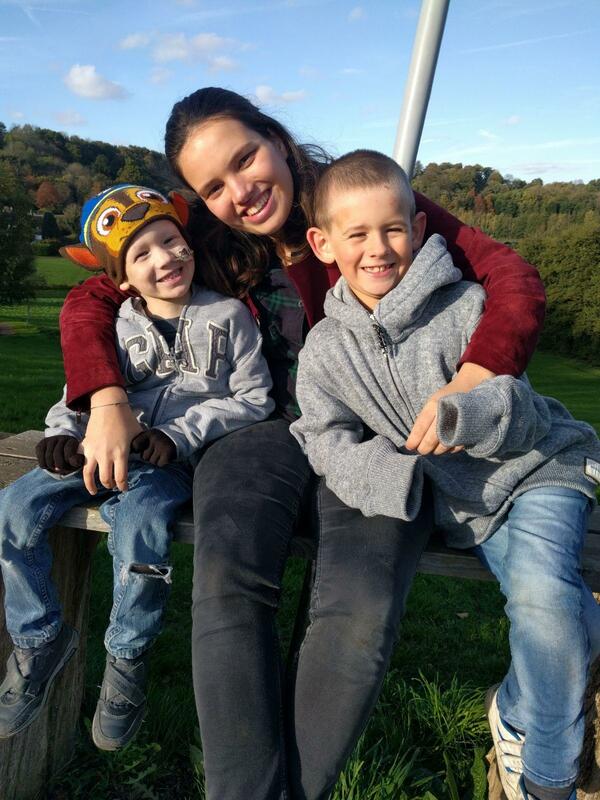 Evelien Kerkhof has been far more than your average au pair over the past 18 months, she's been a key part of our family and helped get us through the worst year of our lives. Eefje arrived in the UK from the Netherlands in October 2016 to join our us and our two boys, Alex (8) and George (5) in Surrey. Her primary role was to look after them as well as support our busy working lives. She rapidly bonded with all of us and quickly took control of the kid's school and extra curricular routines as well as helping around the house. 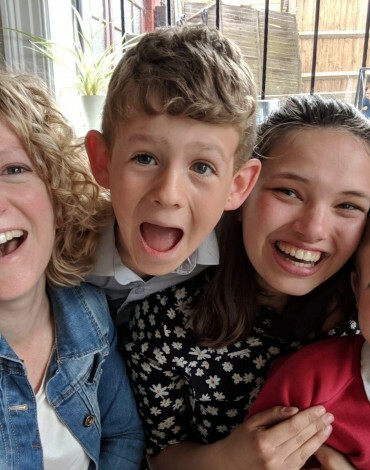 She'd only been living with us for 8 weeks when our lives were dramatically changed over night with the discovery of a lump on our youngest son George's back. In January 2017 George went on to be diagnosed with a rare childhood cancer, a soft tissue PNET Ewing's Sarcoma to be precise. It was a huge shock to everybody as George was a perfectly fit and well, happy little boy up to this point. We would have more than understood if Eefje wanted to leave us - it was so much for us to take on let alone a teenager on a gap year to comprehend - yet amazingly she stayed and made it clear she wanted to help as much as she could. Just when we needed her the most she stepped up in every way possible. Everything from evenings when chemo treatments meant we weren't able to get home to collect our other son from school or put him to bed she was there for us. On the many scary infections George had, which meant we dashed out the house with him in the middle of the night sometimes, she was flexible and took everything in her stride. Not least her being there to help give both of us a break on the odd occasion. There are far too many examples where she exceeded herself and gave us much needed support to mention all of them but in the summer of 2017 she excelled herself even more than she ever had before. Halfway through George's treatment plan it was decided George would need major spinal surgery. 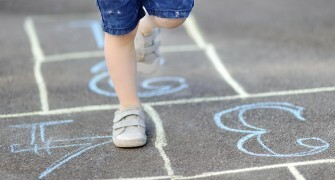 This meant he required round the clock care and essentially needed both of us parents there. His surgery took place at the Royal National Orthopeadic Hospital in North London, a good two hour drive from our Surrey home. What was predicted to be two weeks recovery ended up taking seven! We tried our best for one of us to be at home as much as possible to support Alex but Eefje essentially soon became the most consistent person in our eldest son's daily life. We simply don't know what we would have done without her. When we finally all returned home George was now in a wheelchair and, by this point, a very different little man to the George she first met. Again, Eefje took everything in her stride and played with him, helping him get in and out of the chair and eventally mobile again. Shortly after that the NHS sent us to America for Proton therapy - unfortunately she couldn't come with us on this part of the journey - however she was able to stay in our house for the time we were away which was amazing to be able to trust someone so much to look after our house and life in the UK. On our return she continued her amazing work with the boys and in February 2018 we got the fantastic news that George had 'no evidence of disease'. There's no doubt in our minds that her sunny disposition and fun nature has played a massive role in both getting our son better and keeping our family strong throughout this difficult time. She leaves us this May 2018 to start her Uni career and we will truly miss her. Undoubtably she will leave a big hole in our lives. 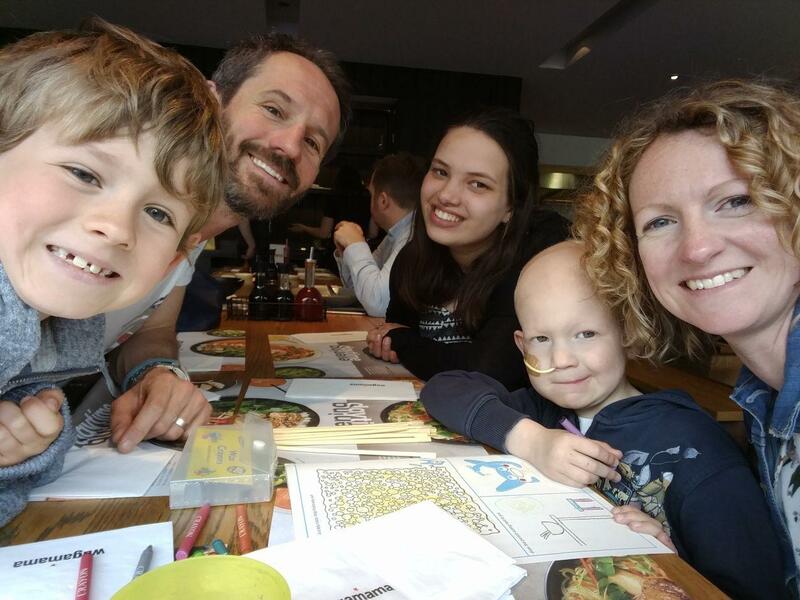 We're sure that these past 18 months haven't been anything like what she would have imagined when she first started life as an au pair, but we're truly blessed that she chose us in the first place let alone to stay with us on our cancer journey. The first moment I saw George, one of my new host children, he had his arms wide open to hug me as I stepped into arrivals at the airport. From that moments I knew this aupair experience would be a unforgettable one. It definitely was, but not in a way I expected. After I had been living with them for eight weeks and we found out about George's tumour. From the moment they told me, I knew that I wanted to stay no matter what. Like I said I felt like a member of the family I just couldn't leave them in this situation. When his cancer treatment started they made sure everything was okay for me, enough food, clear instructions for Alex and things like that. They checked on me a lot, and asked me of I was still okay with the situation? This for me was a difficult time. It was just me and Alex, we grew so close to each other, more then I could have ever imagine. He was not just my host child, he became my best friend, my little brother!! In the meantime they were trying to carry out more bits with the renovation of the house. Which I think was something incredible, even with all of George’s cancer going on they still found the power to do it. But not only that, they also started another project called "George and the Giant Pledge." They wanted to give something back to the hospital and make something good out of their bad situation, so the Woodall's decided that they are going to raise 1.000.000 pounds to help beat childhood cancer and help other families. Their strength to do this and really go for it, whiles they where going throw such horrible time was incredible to see. After several rounds of chemo, George had changed a lot, this was so hard. He was still the same boy but yet so different. He had lost weight, all his hair and looked very poorly and pale. It was so challenging to deal with, but this was just the beginning…! I was lucky to live in an area with a lot of other aupair’s. I had made some really good friends and they helped me a lot to deal with this situation. We would meet nearly every day when our host children were at school and this was the time to talk about everything that was going on but also to just have fun and to (nearly) forget everything that was going on. In June George had his big operation which meant afterwards he was going to have to learn to walk again which meant that he had to stay in the hospital away from home for a long time. This is when my host parents came back even less and Alex and I were together a lot more. It was hard, but all the parents from the boys school were really supportive and they helped me whenever they could. If you had told me five years ago that when I turned nineteen I’d be living in England with a seven year old boy for about five days a week on my own, with his younger brother having cancer, I would have said are you joking?! But I did and once again mainly because of the strength the Woodall's, my family in the Netherlands and my old and new friends gave me. The Woodall’s always told me that together we are a team, "Team Woodalls + Kerkhof". And if we all work together, we could do it! Every time I felt I was used to the situation, it would suddenly change. A hospital appointment or George would have a temperature which meant back to hospital for a minimum of 48 hours. But none the less we still tried to leave things as normal as possible. They made sure I still did fun things as well, AND we did, I have some lovely memories I will never forget. When it was my birthday for example we all went to a little amusement park. It was one of George first trips since the operation and the smile on his face I will remember forever. When they all went to America for 2.5 months for treatment they gave me the opportunity to live in their house on my own. It was so strange but so good as well. I learnt so many new things once again. I started working in the local coffee shop called West Central. Were I got to know more about the English culture and make some more amazing friends. I worked with such supportive people. Soon after Alex and George’s left for the States their Nana and Grandad also moved in with me whilst they had renovations on their house. They made me feel like their daughter and looked after me like one of their own. It was lovely to see how interested they where in my job at the coffeeshop and in my life in The Netherlands. When my host family got back from America it was a little strange, suddenly everyone was at home and it was hectic and crowded again, but a good crowd! I kept my job at the West Central Coffee Shop and work as an aupair in the same time. This meant I could save to go travelling in Canada & America before I start Uni, again another experience I thought I would never have! I don't want to lie, it has been hard the last eighteen months. But strangely enough I am also glad that I had the chance to live with this incredible family. Not to forget that I had the chance to discover England. I have visited so many beautiful places and I went to many amazing events. Saying goodbye doesn’t exist, I am going but I am not leaving the family. I am sure I will be visiting as often as I can. WE CAN ALL HELP BEAT CHILDHOOD CANCER! 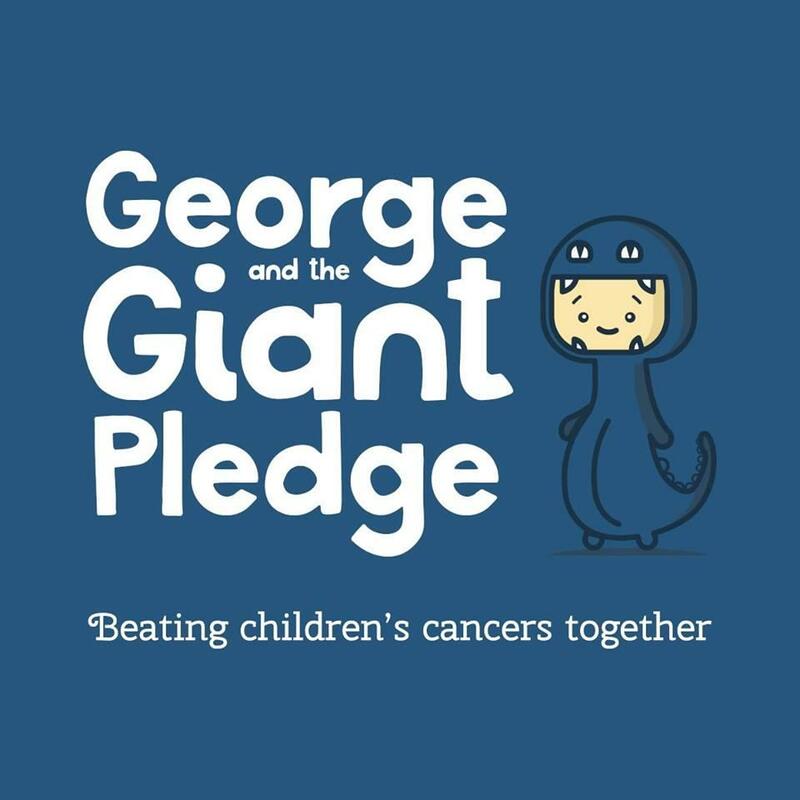 With this article we would also like to draw special attention to the George and the Giant Pledge Charity for which the whole family and Evelien have tirelessly worked for to raise awarness and funds to help beat the childhood cancer. "Ich habe mich als Aupair bei Smart Aupairs beworben und sehr gute Erfahrungen gemacht! Bereits bei der Vermittlung sind die Mitarbeiter sehr hilfsbereit gewesen, die Vermittlung ist einwandfrei organisiert gewesen inklusive Feedbacks voriger Aupairs zu den Familien, sodass ich innerhalb weniger Wochen eine tolle Familie gefunden habe, und die Vermittlungsgebühr musste ich erst nach der Unterzeichnung des Vertrages mit der Familie zahlen. Auch vor Ort hat sich die Organisation immer wieder proaktiv gemeldet, um sich zu erkundigen, ob bei mir und insbesondere mit der Familie alles in Ordnung ist. Als ich mich um einen Nebenjob bewerben wollte und dafür eine Nachweis für den Wohnort sowie eine sogenannte National Insurance Number brauchte, haben mir die Mitarbeiter umgehend einen beglaubigten Nachweis geschickt und mir gesagt, wo ich mir die National Insurance Number besorgen kann. Außerdem ist die Organsiation sehr bemüht Socials zu organisieren und ankommenden Aupairs damit ein gutes Netzwerk zur Verfügung zu stellen. Ich würde Smartaupairs jedem uneingeschränkt weiter empfehlen. Eine seriöse Organisation wie Smartaupairs ist wirklich jeden Cent wert, wenn man als Aupair ins Ausland geht! "